New 2018 JL Wrangler Design Details Emerge: Sloped Rear? 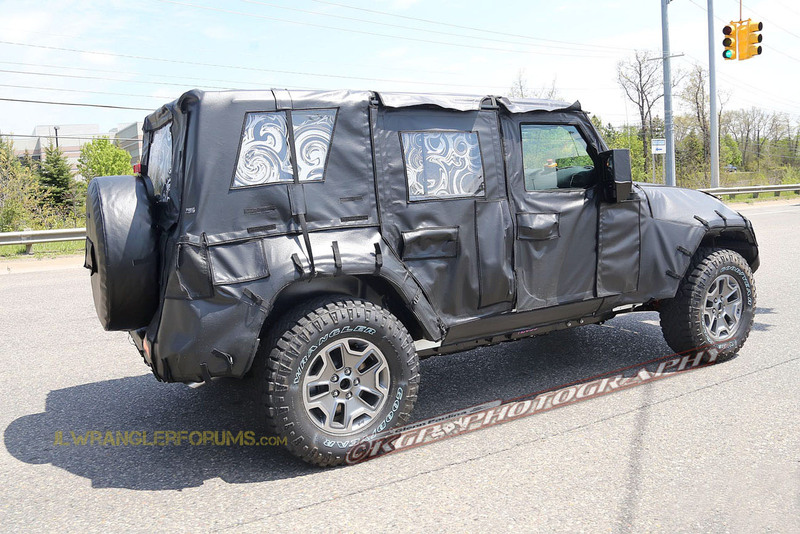 Recent spy photos have captured new design details of the 2018 Wrangler which show an interesting C-pillar design. Originally reported on by JLWranglerForums.com, an open tail gate on a camouflaged ’18 Wrangler revealed an angled C-pillar, which could mean the new JL Wrangler is going to have a sloped rear. As you can see in the above photo, the C-pillar comes in on a slight angle which ultimately means that the ’18 JL Wrangler will have a less-squared look than it’s predecessors. With this C-pillar design the side profile and rear view will be more angled and less boxy than the JK Wrangler. This also implies that the sport bar will not be returning to the 2018 Wrangler, something that has been rumored for a while. It’s too soon to rule out the return of the sport bar, but based on these photos it doesn’t look like it will be coming back. Another takeaway from these spy photos is the rear glass/window design. In these pictures of the 2018 Wrangler test mule you can see the folded-up rear glass which appears to be attached to the struts, mounted to the bottom of the C-pillar. Worth noting and not seen in these pictures, is that FCA recently patented a design that would allow the back glass to fold up over the top of the roof and be fastened down, resting on rubber rests. I am curious how this will interact with Jeeps 3 new top designs for the 2018 Wrangler. It is hard to imagine a glass Jeep top with a glass rear window resting on top. With all of the heavy camouflage it is hard to see much of anything, but it is still exciting to get these teasers of what is to come. These recent design details are another piece in the growing puzzle that is the 2018 Wrangler. The next-gen Jeep off-roader has been slowly revealing key details to how the look and performance of the JL Wrangler is coming together, setting it apart from the outgoing JK Wrangler. Considering all the other design cues that have been flushed out already, it seems like Jeep/FCA is really trying to break away from the typical Wrangler mold that has been around for so long. However, it seems like they are doing it gradually, and still paying homage to the designs that have come before it. What are your thoughts on the C-pillar design on the 2018 Wrangler? Is this a welcomed design refresh or something that should have been left on a drawing board? Comment below!